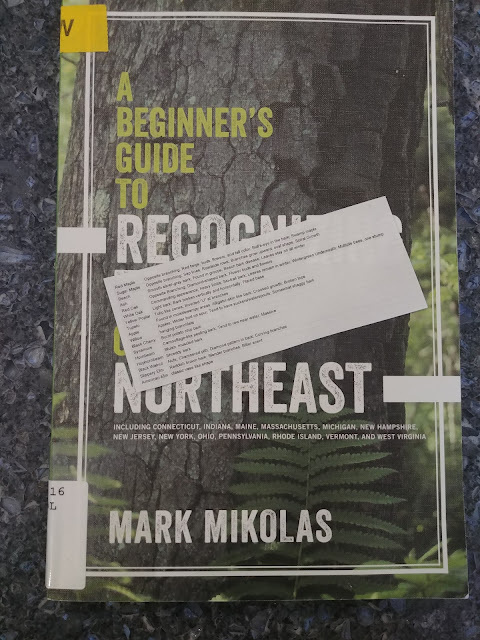 Perusing A Beginner's Guide to Recognizing Trees of the Northeast by Mark Mikolas is like taking a walk through woods with a clever naturalist. Rather than approach the identification of trees with scientific completeness, she seems to know which tree is which through one trick after another. This one over here, she explains, is a obviously a beech tree because it has gray-silver bark and while it's the dead of winter, it still has its leaves. Mikolas' book has a simple recipe format. Name the tree, list useful cues for identifying the tree, and then spend a few paragraphs expanding on each cue. There are also photographs that visually depict the cue, which of course is quite helpful. The book is relatively brief, covering about 45 trees or so. However, what it lacks in depth it makes up for in functionality. One of my little pleasures is identifying plants and other objects I come across while in the wilderness. To know something's name is to appreciate it on a deeper level than just the broad category of plant or tree. So for me, Mikolas' book is a win. It's not just that my chances of identifying trees is increased. By keeping the books cues in mind, I find myself noticing details about trees I'd never considered before. Which direction do the branches grow? What kind of shape or texture is the bark? Does the tree have its leaves in the winter? Even if the list of trees I can identify doesn't greatly increase, I'm thankful to Mikolas to opening my eyes to new features I'd never considered. My plan is to carry this cheat sheet with me in my wallet and put it to use on our next hike. You're welcome to use these cues too, though without Mikolas' explanations, I doubt they'll mean a whole lot to you. There's a time and place for a Peterson Guide to Eastern Trees, but if you want a fun and non-overwhelming approach to tree identification, 'Recognizing Trees' is the way to go.